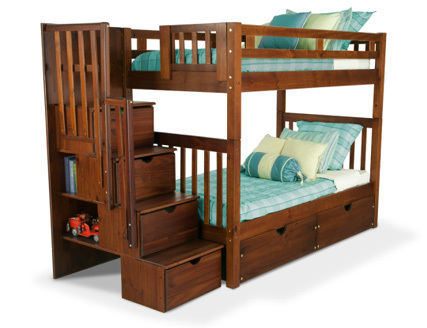 Last week we ordered this bunk bed from Bob's Discount Furniture for our 4.5 year old twins, and it is being delivered today! They have no idea, I can't wait to see how excited they get once they see their new beds. Our plan this year was to start at Walmart, then hit Target, possibly Toys R Us and finally the mall. Since the Walmart and Toys R Us doorbusters started only an hour apart, there was no way we could be at both. I picked my sister-in-law, Tracey, up early, around 7:45 on Thanksgiving night. We were at Walmart by 8:00 - a full 2 hours before the doorbuster deals started. And yes, it was already getting crazy. We threw some of the sale items that weren't shrink wrapped into our cart, like the bikes for my kids. OK fine, we may have ripped open some shrink wraps on a few items, like the $9 Bissel Stick Vac. Which is totally awesome by the way. The Walmart associate guarding the $9 griddles was on to us though and wouldn't let us open those up. By 8:45 we had everything that we could get into our cart, so we parked down a side aisle to get out of the crowds and waited for 10:00 to arrive to get the rest of the doobusters on on our lists.While we waited, I used my iPhone to try and get some of the Toys R Us deals that were online. I had pre-filled my online cart with the items I wanted and refreshed it at 9:00 when their sale started. Everything I wanted was there and I was so excited to be able to get two stores done in one shot. But then I tried to check out and that's when the Toys R Us site crashed. I tried to check out for two hours. By the time I was finally able to get it through, most of the items were out of stock. 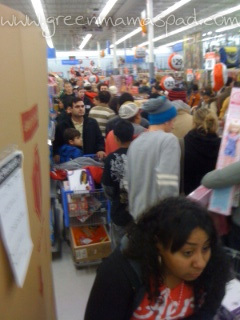 night doorbusters at a Walmart in CT.
Taken by Tracey from her safe spot. Occasionally we would peer out from our safe aisle to check out the growing crowds around the toys and electronics departments. The "stations" for the doorbuster video games were heavily surrounded by 20-something year old guys waiting to grab as many cheap games as possible. At one point we could hear Walmart staff yelling at them to back up away from the Xbox games. It was starting to get insane, and it wasn't even 10:00 yet. When the rest of the shrink wrapped items were cut open at 10:00, it was a free for all. Those guys wiped out the PS3 games in less than 30 seconds. We decided not to take our big cart loaded with stuff out of the aisle. Instead my sister-in-law stayed in the safety of the aisle while I went out on several missions. I ran out and grabbed her electric griddle, literally hurdling fallen objects along the way. And when there was an opening that would allow it, I ran. I grabbed a few cheap movies and after circling the store several times, finally found the Wii games. We got on line and Tracey ran out to grab some pajamas for my niece and nephews. The checkout line actually wasn't too bad, but getting from the checkout line to the front door was backed up. We were in my van by 10:45 and headed about a mile down the road to Target. And this is where the "bust" part comes in. We got in line at about 11 outside of Target. It was pretty long, but wasn't the farthest back we had ever been. As we stood there I started to feel sick. It started with dizziness and there were a few moments I thought I might pass out. So I sat on the ground. Then the nausea kicked in. I held it off for as long as I could. But at midnight, right when the Target doors opened and they started letting in small groups at a time, I couldn't hold the sickness off anymore. We ended up leaving and going home. I spent all of Friday in bed or on the couch with the most horrid stomach bug I have ever had. I did end up bringing my laptop with me to bed at one point and was able to get a lot of the stuff online that I missed out on at the other stores. Thank you Amazon for matching some of the Toys R us deals! So overall while I did end up getting almost everything, I was and still am disappointed that we had to cut our Black Friday shopping marathon short. Doing it all online just isn't as fun. How did your Black Friday shopping experience go this year? In honor of Black Friday tomorrow, I thought it would be fun to post an infographic with a little history about the biggest shopping day of the year. After we go to my in-law's this afternoon for a Thanksgiving meal with family, we will head back home and i will scurry to get the kids in bed. And then I will be off to pick up my sister-in-law around 8:00pm as we head out on our Black Friday mission. I will be sure to recap our night and the deals we got once I regain consciousness sometime over the weekend. While everyone is usually seems to be looking for great deals on big screen TVs and the hottest toys on Black Friday, there are also some great deals to be had on natural products! This Black Friday and Cyber Monday, get 25% to 40% off dozens of products at Abe's Market plus free shipping on all orders! Check some people off your holiday gift list while shopping from the comforts of your home. Or maybe pick up a little something special for yourself. The sale starts Friday, November 25 and lasts through Monday, November 28. While supplies last. Having a family game night is a really great way for everyone to gather around, spend some quality time together, unplugged, and just have some fun. Introducing board games at a young age is good and hopefully will help to build a long standing tradition. We have some of the classic board games, as well as some Star Wars versions of classic board games. I was recently given the opportunity to try a Tales to Play game from Patch. "Our Tales to Play™ line of games brings to life classic and beloved stories for children and families to enjoy. If you love the book, then you can now live the game with colorful game boards, including 3D accessories and detailed characters. Each game is an adventure, much like the ones children read about in books, and each time you play you'll experience the magic and whimsy of a great story being told. We received The Little Engine That Could Game to play with. My children are familiar with and enjoy this book a lot, and we actually have three copies of it. The game brings the story to life for them with bright blue train engines that move along the tracks on the game board till they eventually make it up the big mountain. 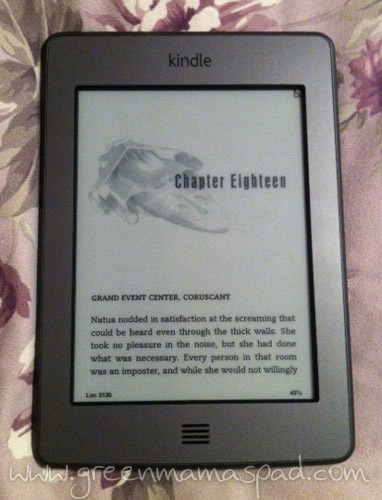 My Kindle Touch arrived over the weekend and I am head over heals in love with it! It has been years since I last sat down to read a book. 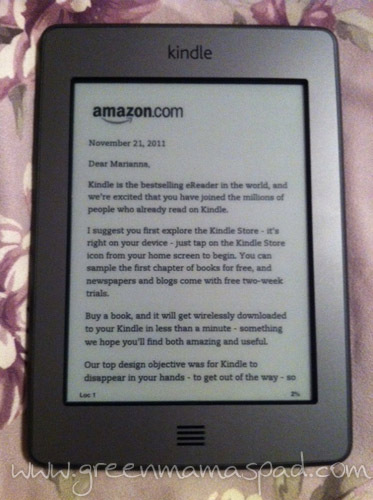 I downloaded my first eBook on Monday morning and by Tuesday night I was already half way through the book. I need to slow down or else I am going to be spending too much money on eBooks. Yes that is a Star Wars book I am reading. I missed them so much. Stop laughing. The best part? I didn't pay anything for it! I used all the Amazon gift cards I had saved up over the past year from Swagbucks to pay for it. Thanks Swagbucks! My youngest son's birthday is in December, just before Christmas. So every year I am left with the challenge of finding him good birthday presents in addition to Christmas presents. To be honest, sifting though all of the toy ads can be rather exhausting. Breathing a breath of fresh air into my toy madness this year is Jade's Toy Box. 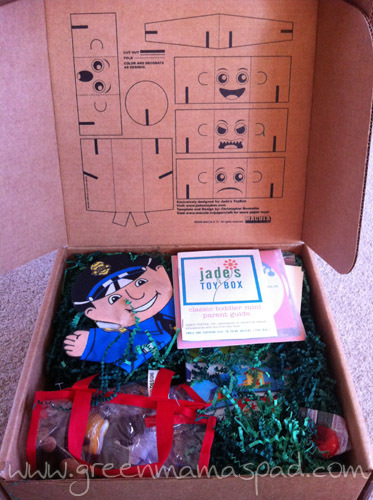 "Each Jade's ToyBox Concept Box™ contains a carefully vetted selection of fun, educational, and eco-friendly toys, books, and games for teaching important themes and concepts, from art and music to health and the body, even sustainable architecture. We do the homework for parents, researching the best quality, safest products that are available: products devoid of lead, BPA, phthalates, and other potentially harmful materials that do not belong in your child's environment. Our products aren’t covered with the latest cartoon character, and they don’t require batteries." 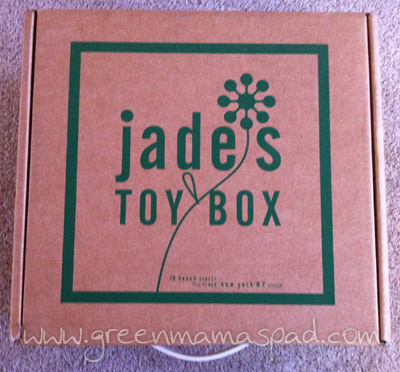 Jade's Toy Box has a variety of box sets that are specific for certain age: newborns, toddlers and preschoolers. The sturdy cardboard box is filled with age appropriate educational, fun and eco-friendly toys. I received their Mini Classic Toddler Box from Abe's Market for review. This box set is for ages 2+, though some items might be 3+. 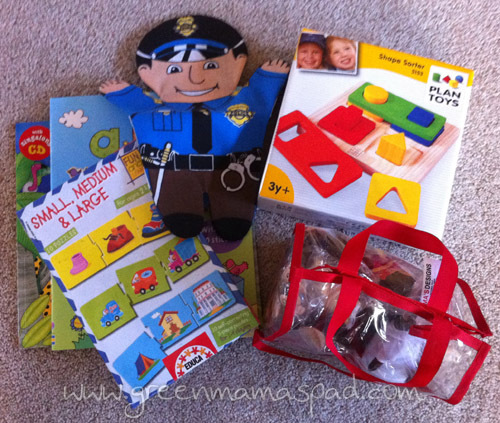 In our box there was a shape sorter, picture book, sticker book, hand puppet puzzles and a parent guide. This comes in a thick cardboard box with handle that is perfect for storing and transporting the toys in. When you open it up there is a fun cut out activity on the lid that you can do with your child, but I am keeping it in tact for now so I have a place to put the toys back into when he's done playing. These are all of the goodies that were included in our box. I was impressed wit the high quality items like Plan Toys. 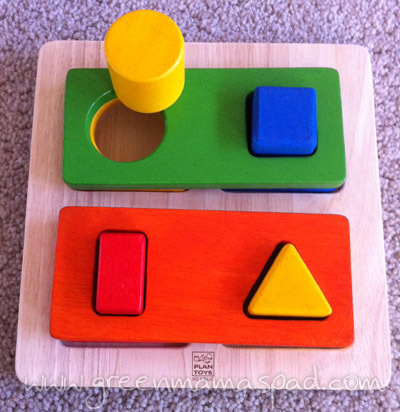 The Plan Toys shape Sorter. I am a huge fan of anything Plan Toys makes. Their quality is amazing and their environmental awareness and commitment is even more amazing. I was thrilled that this set included a toy from them. This shape sorter is labeled for 3+ so a 2 year old may need some assistance. 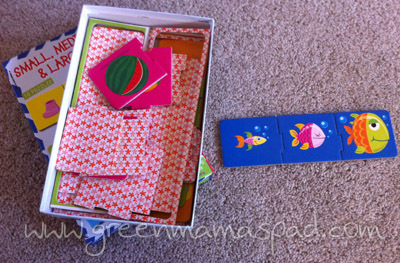 I love the vibrant colors and my son loves putting the shapes and pieces together. This set of puzzles is great for this age group and I love that it comes in its own box so that the pieces don't get lost. I'm not sure what to call this "5 Little Monkeys" set but it is so adorable. 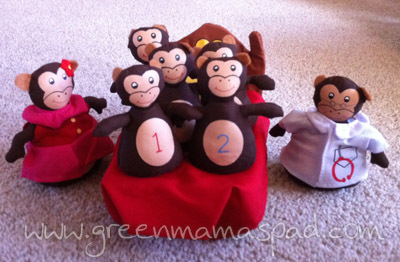 Each monkey has a weighted bottom so they stand up straight and we have a lot of fun acting out the nursery rhyme with these. 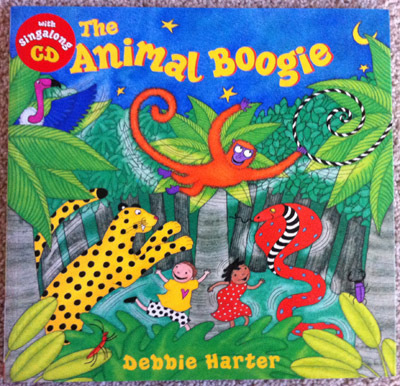 Reading to your child for at least 15 minutes a day is so important, and what better way to do that than with this colorful book, The Animal Boogie by Debbie Harter. It even includes a singalong CD. What child doesn't like stickers? My older three boys are obsessed with them. 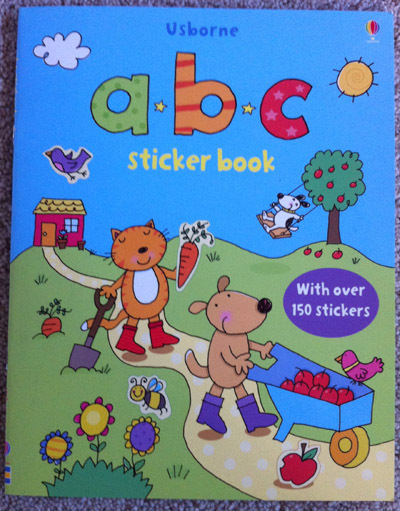 My almost two year old has not yet ventured into the world of stickers, so I am storing this ABC Sticker Book from Usborne for a rainy day. There is so much fun packed into this box its amazing. My toddler has been enjoying all of the toys thus far. The puzzles and and shape sorter are a little challenging for him, but it is helping him to really work on those fine motor skills. 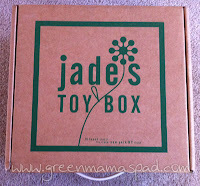 This box and others from Jade's Toy Box make really well rounded gifts. There is a load of activities the kids can do to keep them busy all day long. I think these are prefect for holiday or birthday gifts. Jade's Toy Box "Mini" sets and "Original" sets are available at Abe's Market. The Mini sets retails for $59.00 and the much larger Original sets retail for $199.00. Abe's Market offers free standard shipping on all US orders. Please note that the opinions and views expressed in this review are my own and based on my personal experience with the product and/or company. You may encounter a different experience with this than I did. I received free product to review. Post include affiliate links. Every winter when the snow starts to fall, our four boys are dancing around the door demanding to go out and play. And every year my poor husband puts on sweatpants and then track pants and heads out into the snow with them. Since that combination isn't waterproof at all, the poor man is soaked within minutes. On top of that, he only has old duck boots that don't offer all that much protection from the snow. But he toughs it out because he loves to play in the snow with them. A few weeks ago I mentioned to him that I should get him snow boots and a snow bib as an early Christmas present. He immediately became excited by the idea of not having to freeze his you know what off while out in the snow for hours. Walmart had both at really low prices so last week I finally ordered them. On Saturday the box arrived and he ripped it open to try on his new goodies. He lifted the boots out of the box and I said "Wow, those look huge." And then we noticed something. 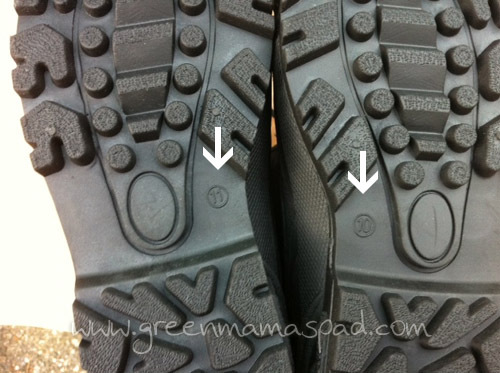 Do you notice that the boot on the bottom seems longer than the boot on the top? The tag on the boots says 10, which is what I ordered, but something is definitely off here. So he flips over the boots to look at the size on the bottom and we figure out what the problem is. 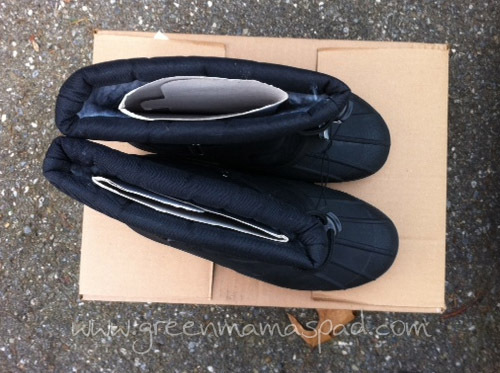 Yes, that would be one size 10 and one size 11 boot, factory packaged together. Brilliant. I swear stuff like this only happens with Walmart. The entire point of me ordering things online is to avoid actually having to go to Walmart. Now I had to drive over there to return it. A return that took 15 minutes because no one knew how to do a return for an online purchase, even though I brought my special return slip. And since our Walmart doesn't carry these in the store, after I returned them and got my store credit, I came back home and ordered them online. Again. I just hope we don't get two different sizes again. What weird things have happened with items you have purchased at Walmart? 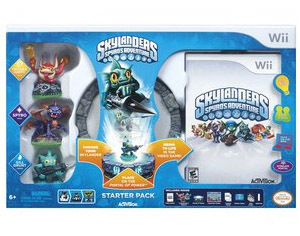 If you browsed any of the big holiday toy catalogs this year, like Toys R Us, Target and Walmart, you probably noticed that Skylanders Spyro's Adventure appeared in all of them. This is one of the hottest games this holiday season. When I first saw the Skylanders Spyro's Adventure Starter Pack I knew this is something that my boys would love and I just had to get my hands on it. Collectible figures that come to life on screen when you place them on the Portal of Power? YES PLEASE! OK, forget the kids. I knew that I would enjoy this too. In Skylanders Spyro’s Adventure, you can ‘Bring Your Toys to Life’ in a boldly innovative adventure game where players collect real-world interaction figures and teleport them directly into the game using a mystical Portal of Power™. Propelled by a story-driven adventure, players take on the role of a powerful Portal Master who can control over 30 different characters, including the beloved fire-breathing dragon Spyro. Players will embark on a fantastical journey into an amazing world, where they will explore mysterious, mythical lands, battle menacing outlandish creatures, collect gold and treasures, and solve interesting puzzles while on a quest to save their world from Kaos, an evil Portal Master. Skylanders Spyro's Adventure offers a whole new way to play. Kids can have fun playing with the many collectible figures off screen and then bring those characters to life on screen. The "interaction figures" actually store and remember the player's shared experiences such as ability, upgrades and gold collected. So the figures can be brought over to a friend's house to play on their Portal of Power. Wait, what happens if you have a Wii and your friend has an Xbox? And all of the figures can be used across all platforms. With "Cross-platform Playability" you are able to use your figures on other platforms, so you don't have to worry that your friend's is different than yours! What better way is there to display your beautiful family portrait than on a rolled canvas print? For years we have been saying that we want to hang our family photo over the fireplace, but it has yet to be done. I am a master procrastinator. This weekend we should hopefully be taking our family photo for our Christmas cards so my hope is to use that same photo to get a canvas print to hang up. Rolled canvas is ideal for art reproductions, photo printing and digital work production. At UPrinting, you can choose among eight popular standard sizes or customize your own size. You can order from 1–100 prints. A poly-cotton blend makes the material highly durable. 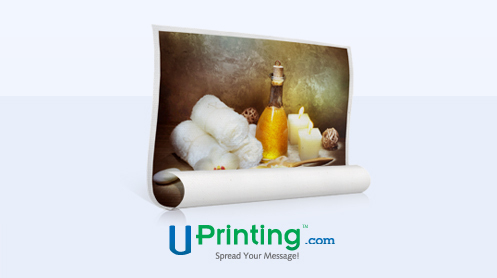 It is coated with eco-friendly protective matte finish that preserves the quality of your prints. With fast turnaround times, you can get your custom rolled canvas in no time! ~ Entrants who have already won this item from another blog are not eligible to win again. Complete the following for one entry each. Be sure to leave your email address in each comment so I can contact you if you win. Use this button to "Like" the UPrinting Canvas Prints page on Facebook. Then leave a comment with your Facebook name telling me how you would use the canvas prints if you win. 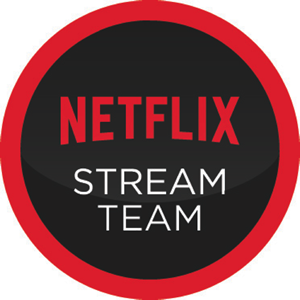 Tweet Use this button to Tweet about this giveaway. Leave a comment with the URL of your tweet. Follow me on Twitter and leave a comment with your Twitter handle. 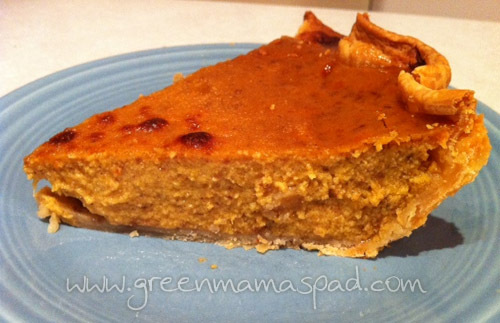 Like Green Mama's Pad on Facebook. Leave a comment with your Facebook name. This giveaway is open to legal residents of the United States, 18+ only and will end on Wednesday, November 30 at 11:59 PM EST. One winner will be chosen at random using Random.org and will be posted on the Winner's Announcement Page. Winner has 48 hours to claim his/her prize otherwise a new winner will be picked. Please allow 6-8 weeks for delivery. Prize fulfillment is the responsibility of the sponsoring company. This blog and its author are not responsible for giveaway prizes that are lost in transit or damaged. This blog is also not responsible if a sponsor/company does not send prize(s). Naturally, I will communicate with said company(s) several times, and make every effort to resolve the issue. Good luck! This giveaway is sponsored by UPrinting, no monetary compensation was given and I will receive rolled canvas printing service for hosting. So right now I am a little bit obsessed with preparing for Black Friday. It is less than a week away, thanks to stores opening on Thanksgiving night. (Boo). For the past 4 years, BFAds.net has been my go to site for looking at the Black Friday ads. They have scans off all the flyers and you can easily make a shopping list for each store you want to hit. In past years I have used this site to make and print my list and carry it with me to each store. But this year I have an iPhone and I honestly don't have the time to sit at my laptop going through all of the ads. There is a free BFAds.net iPhone app, which I downloaded and installed a few weeks ago. This app allows you to browse through the list of deals by store and make your shopping list. This is great for me because now I will have my shopping list right on my phone with me and don't have to worry about losing my paper list, like I did last year. However the app doesn't contains the full advertisement scans, understandably since that would take up quite a bit of space. But this morning I figured out a way to easily view the full advertisements on my iPhone. 1. In your iPhone Safari browser, go to http://bfads.net/Adscans. You will see the list of stores and under each store is a few ways to download the advertisement. Go to your desired store and then click on the PDF icon. 2. It may take 30 seconds or so for the file to download and open. Once you see the advertisement on the screen, tap once anywhere on it. In the top right corner the button for "Open in iBooks" will appear. Click on this. 3. You will then be brought to your iBooks app, where the PDF advertisement will be stored until you delete it. It is super easy to swipe through pages in this app. Much better than scrolling up and down in the Safari browser. 4. Repeat steps 1 and 2 for as many advertisements as you wish to download. They will all be stored in the PDF section of the iBooks app and you can view them at your leisure. I feel so brilliant after figuring this out this morning and I just had to share it. Now I can easily go through the ads and finalize my list. And tonight my sister-in-law and I are meeting offer coffee to come up with or Black Friday Strategic Plan. I CAN'T WAIT! It is less then one week till Thanksgiving, are you getting excited to spend some time with family and gobble up all of that yummy food? My absolute favorite Thanksgiving dish is my mom's stuffing. It is to die for. I honestly could care less about the turkey, just give me a big ole heaping plate of that stuffing and I am happy. 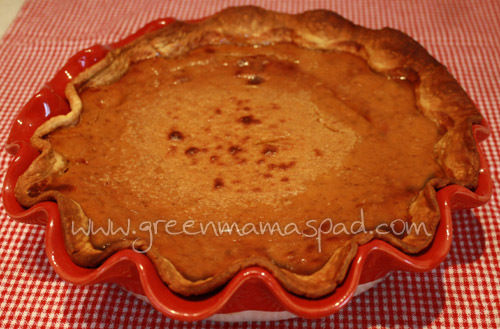 What is your favorite thing to eat on Thanksgiving? Here is a Thanksgiving Day infographic with fun and interesting facts about the day.